Guest Editorial: Can Mapping Exist Separately from Surveying? What am I supposed to do now? I crafted an RFP for lidar data collection back in October 2010 for a local government in central Florida. Under my reading of Florida statutes and the opinion of our city attorneys from a national law firm, some parts of the work were within the scope of regulated surveying and some parts were not, so I carefully stated that a Florida-licensed surveyor was required to perform those parts of the work that were explicitly covered by regulated practice laws. The RFP was reviewed by the city attorney for procurements and advertised publicly. After a couple of weeks, we got a complaint from the Florida Surveying and Mapping Society (FSMS) that raised two points. First, they said all the work listed in the RFP had to be done by a licensed surveyor, not just the parts we classified as such. Second, because all the work was surveying, the procurement had to be qualifications based; i.e., no prices could be included in the proposals. Our city attorneys reviewed the statutes in more detail and examined the information provided by FSMS. They again concluded that lidar data collection was not within the scope of licensed practice. FSMS threatened to sue the city if it didn’t change the procurement. The city offered to remove pricing from the proposal evaluation process. FSMS said that wasn’t good enough. To make a long story short, the city ultimately chose to withdraw the open procurement and assigned the work to one of its surveying firms already under contract. Must all three of the components required in §472.005(4)(b), Fla. Stat., for the practice of surveying and mapping (i.e., “the application of special knowledge of the principles of mathematics, the related physical and applied sciences, and the relevant requirements of law for adequate evidence”) be present for a task to fall within the scope of such practice, or does the statute place any professional activity involving mathematics and physical sciences within the scope of surveying and mapping? Can only a Florida-licensed surveyor and mapper compile vector objects from raster images? Can only a Florida-licensed surveyor and mapper use photogrammetric methods? Does the specification and provision of lidar data collection and analysis services fall within the definition of surveying and mapping, as provided in Florida statutes and Florida administrative code? Can only a Florida-licensed surveyor and mapper use handheld GPS units to collect data on the location of natural and manmade objects? Does the production of any map product—showing the natural and artificial features of a part of the Earth’s surface to determine horizontal and vertical spatial relationships—result in an as-built survey or a topographic map that must be produced under the responsible charge of a Florida-licensed surveyor and mapper? Can only a Florida-licensed surveyor and mapper produce metadata describing the method of compilation and analysis resulting in a spatial dataset? 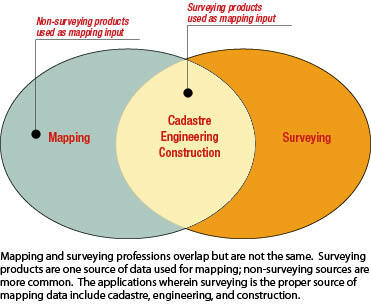 Are other professions allowed to use the tools and techniques frequently employed in the practice of surveying and mapping without being subject to the licensing requirements in Chapter 472, Fla. Stat.? These questions were posed, in part, by the incident with the lidar procurement, but also because of my private part-time GIS consulting business. I was genuinely confused about what was regulated surveying and mapping and what was not. I cited several examples of conflicting evidence and asked for them to be reconciled with a clear declaration of a boundary line (no pun intended) between what was and was not regulated practice. For example, we have FSMS and an April 2010 declaratory statement from the Florida Board of Professional Surveyors and Mappers saying that all uses of photogrammetry require a license, whereas a state agency, the Florida Highway Patrol, is teaching unlicensed persons how to apply photogrammetric techniques to document traffic crashes. An FHP officer even wrote a book about how to use photogrammetry for law enforcement. How can unlicensed persons—law enforcement officers—openly and consistently violate state law in the official performance of their duties? We also have thousands of GIS users compiling data from aerial photographs and using handheld GPS units, but I don’t recall ever hearing about any of them being charged with the unlicensed practice of surveying. I read everything I could to find a statutory reference or regulation that said lidar is photogrammetry in Florida and couldn’t find a single instance. Even the April 2010 declaratory statement issued by the board didn’t make that claim, but FSMS had made the connection and was now threatening to sue my employer because of it. Since lidar is functionally identical to radar, the only difference being the frequency of radiation used, then wouldn’t all uses of radar also require a surveying license? The list of conflicts went on and on. If all these people were doing things they shouldn’t, then why wasn’t something being done to enforce the law? Our statute never says, ‘For whom are you doing it?’ And it never says, ‘How close are you getting?’ It says, and it is very clear actually, ‘the act of measuring, locating, establishing, or reestablishing lines, angles, elevations, natural and manmade features in the air, on the surface and immediate subsurface of the earth, within underground workings, and on the beds or surface of bodies of water, for the purpose of determining, establishing, describing, displaying, or interpreting the facts of size, shape, topography, tidal datum planes, legal or geodetic location or relocation, and the orientation of improved or unimproved real property and appurtenances thereto, including acreage and condominiums.’ It doesn’t say who you’re doing it for or how close you’re getting. It says you are locating it, measuring it, and displaying it. I think that’s crystal. ... My point about what the statute says is that it doesn’t mince words, that it is very clear, if you are measuring it and locating it and displaying it, then you’re practicing surveying and mapping. Later in the discussion leading up to a vote on the motion by Ms. Nobles to deny the petition for the reason that the answers are obvious through a reading of the statutes, the FSMS attorney read a list of items, stating which are within the scope of licensed practice. Principle among such tasks that require a surveying license, in her view, are utility-inventory and mapping, GIS-infrastructure base mapping, and crash-reconstruction mapping. The board and FSMS were telling me that any process that measured and mapped anything fell within the regulated practice of surveying, regardless of scale, accuracy, or precision. Indeed, they were telling me that there is only one permitted accuracy level: surveying grade. Such an interpretation essentially means that I and other GIS professionals cannot compile vector data from orthophotographs by tracing the outline of visible features, nor can we use handheld GPS units to compile inventory-level data about cultural and physical phenomena. In other words, if a Florida-licensed surveyor didn’t provide the data to us, then we could not use it. When it became clear that the board was going to deny my petition, I asked them to include some reference to the many statements made about the “obvious” answers to my questions so that GIS professionals and others could be properly advised as to the limits of their permitted activities. I was particularly concerned about statements made by the board’s attorney, who suggested that my being certified as a mapping scientist in the field of geographic and land information systems by the American Society for Photogrammetry and Remote Sensing violated Florida law because the words ‘mapping’ and ‘land’ were in the title. Such a violation carries criminal penalties. There was also the board member who made a motion that I be investigated for unlicensed practice, to which the board’s attorney replied that investigators were in the audience. In the end, though, the final ruling had no references to any of these statements: “The substance of the Petition, the pleadings filed in support of the Petition, and the Petitioner’s testimony at the public hearing all demonstrate that the Petitioner has requested a broad statement of agency policy, where the applicable statutes and administrative rules have a plain and unambiguous meaning.” I even asked FSMS to work with me to write a magazine article about the issues; they said absolutely not. I am left pondering the apparent inconsistencies between the “plain and unambiguous meaning” of the Florida statutes and the many apparent conflicts in actual practice, such as there being no reference in state statute or regulation or in any board ruling that says lidar is part of photogrammetry, or that law enforcement officers using terrestrial photogrammetry to map traffic crashes and thousands of GIS professionals and technicians who compile data using handheld GPS units are violating the law. In fact, an internal FSMS memo references exactly this problem and advises against pursuing a course of action to enforce the statute, as to do so would motivate legislative changes. Spatial data are typically evaluated using five criteria. Mapping requires many different answers; surveying provides one. How you got the answer, represented by the criterion of lineage, is the most important consideration for mapping and surveying. Lineage—Sources and data processing steps used to produce the final dataset. Attribute Accuracy—How thoroughly and correctly the features are described. Logical Consistency—The extent to which geometry and cartographic consistency problems exist. Completeness—Whether the observed phenomena are fully contained in the dataset. Positional Accuracy—How closely the mapped locations of features match their real-world location. Positional accuracy for mapping is relative to the intended use. In most cases, relative position between features is more important than absolute accuracy. Positional accuracy for surveying is absolute, as it has to be correct at a 1:1 scale. Relative Position—Location of features relative to each other across a geographic extent. Connectivity—Intersections and junctions are logically consistent with the real world. Shape—The extent to which geometry reflects the spatial extent of the real world feature. Horizontal Position—Accuracy of feature’s x, y position relative to actual location. Vertical Position—Accuracy of feature’s z position relative to actual location. I want to address one more point. Rather than answer my legitimate questions, FSMS, MAPPS, NSPS, and the board elected to make this personal. FSMS went so far as to argue “that what Petitioner truly seeks is an emasculation of the provisions of Chapter 472 by declaratory statement rather than legislative action. … Petitioner advocates the demise of the surveying and mapping profession, and contends that modern technological tools have replaced the traditional surveyor and mapper.” They then went on to reference my writings for Professional Surveyor Magazine in their pleadings, at the hearing, and in a memorandum circulated to FSMS members. Let me be clear and unambiguous in response: I am not the enemy of the surveying profession. As recently as April 2011, I spoke in support of the role of surveyors in land management at a World Bank conference targeted to Europe and Asia. I routinely employ licensed surveyors for a variety of purposes through my local government work. What I am is a proponent of the regulation of the surveying profession at a national level, where there can be one such profession, not 50, and the formal recognition of a mapping profession that exists separate from the surveying profession. Saying that everything is surveying won’t work. Spatial data, such as aerial photography on Google Earth and maps in GPS-based navigation systems, are part of interstate commerce. As far as I know, the Florida board is not writing cease and desist letters to Google, Lockheed Martin, or Tele Atlas. Ignoring this reality makes a mockery of the very statutes surveying societies and state boards try to protect. My message: Enforce the letter of the law or change it. You may be wondering what happened after the hearing with regard to the threat of civil and criminal charges. The short answer is “nothing.” Frankly, I am disappointed. Maybe they would have to answer my questions if they had to prove that practicing the mapping profession without a surveying license is against state law. Perhaps they have elected to keep a low profile after the 2011 Florida legislature considered a bill to eliminate the state regulation of surveying as a profession. This bill made it through a couple of subcommittees before being modified to take the surveying profession out of the language. Or, perhaps, they decided not to risk a negative outcome, being concerned that opening the law to modification might lead to changes they don’t want. As long as there is never anything officially on the record regarding their interpretation of the statutes, there is nothing to contest. I really am not looking for a fight. I would much rather work with the surveying community to jointly define the rational range of activities for the surveying and mapping professions. NCEES started the process several years ago when it adopted the Model Rules, which include a list of activities that are outside regulated surveying practice, i.e., give examples of the mapping profession’s activities. Although I have been describing the situation in Florida, there is nothing to keep this same scenario from arising in other states with laws that make no formal allowance for non-surveyors to compile spatial data. The recent actions by the Florida legislature and similar events in Texas and Rhode Island are evidence that change is coming from the outside, if need be. We all have a stake in this debate. It is time we allowed the states to move into the present day by recognizing that surveying and mapping are now two professions, not one. The federal courts recognized the existence of a separate mapping profession when Judge Ellis issued his June 2007 decision in the case of MAPPS et al. v. U.S.A., saying, “the record unambiguously reflects that the provision of ‘mapping’ services in the modern marketplace includes a much broader scope of work than the traditional mapping work of land surveyors.” The mapping profession exists. Other people besides surveyors compile spatial data and make maps, and many of those maps cross state boundaries. Our regulatory framework should recognize those facts. State regulation of property administration may still make sense, but state regulation of mapping does not. If history has taught us anything, it is that the problem will eventually be fixed. It can be fixed by us or be done to us. The present situation has some of us clinging to a set of rules at the state level that no one really enforces. How else can you explain the paradox of law enforcement officers doing work that state laws say they cannot do? So, tell me, why you don’t want to be part of the solution? Let’s end the practice of taking positions and issuing threats and genuinely try to fix this problem by clearly stating what requires a surveying license and what persons with other qualifications can do. Or help me understand how you think you can ignore the march of technological and regulatory change. I am not asking for a division of the marketplace, like two street gangs dividing a neighborhood. I am asking for a shared marketplace with a valid and recognized role for each participant. J. Allison Butler, GISP, AICP is a fugitive from justice somewhere in Florida.